The Rugby Football Union has entered the television contract dispute by stating it did not give permission to Premier Rugby to sell European rights. Premier Rugby, which represents England's top 12 clubs, is in conflict with European Rugby Cup (ERC). 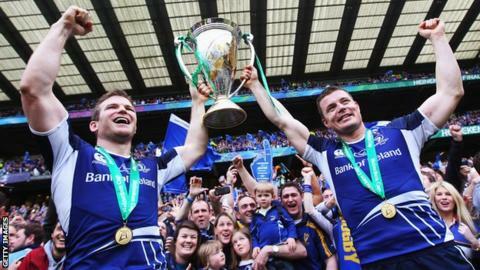 ERC, which oversees the Heineken Cup, believes Premier Rugby exceeded its powers by selling European rights to BT Vision for three years from 2014. And an RFU statement has confirmed that it did not give approval for the deal. Premier Rugby announced a £152m, four-year agreement with BT Vision on Wednesday. The deal covers Premiership games from next season, but also includes a three-year arrangement for BT Vision to show live European matches involving leading English clubs. But ERC, which is also responsible for the Amlin Challenge Cup, claimed it was the only organisation that could negotiate TV rights and announced a four-year deal with BSkyB, running until 2018. There is, however, currently no agreement in place to continue the Heineken or Amlin Challenge Cups beyond 2014. Premier Rugby claimed it had been given authority to sell the rights as part of an eight-year agreement with the RFU signed in October 2007. But that version of events has been dismissed by the RFU, English rugby's governing body, which called for the Heineken Cup board to find a compromise when it meets in Dublin on Tuesday. "The RFU will continue to liaise with all stakeholders in order to help reach a conclusion which benefits all," said an RFU statement. "While the RFU has not given consent to Premiership Rugby to grant European broadcasting rights, we believe it is important to work with them and with all parties involved to find common ground. "We anticipate that this process will begin at the ERC stakeholder meeting on Tuesday, September 18." But the planned move is seen as a negotiating tactic to push through changes to the way in which European rugby union's leading club cup competitions are run.